To meet projected growth, Southfield-based Bluewater Technologies Group has moved part of its audio-visual operations to a newly-renovated 26,000-square-foot facility in Farmington Hills. Established in 1985, the company works with OEMs, ad agencies, producers, and exhibit houses to create live event and audio visual technology experiences. The company’s clients include Cadillac, Chevrolet, Ford, Campbell Ewald, Team Detroit, Wells Fargo, GMC, Buick, and Progressive. Some of the company’s work will be on display at next week’s North American International Auto Show at Cobo Center in Detroit. The new space will feature an open floor plan, huddle rooms, and personal work spaces designed to create a collaborative environment. 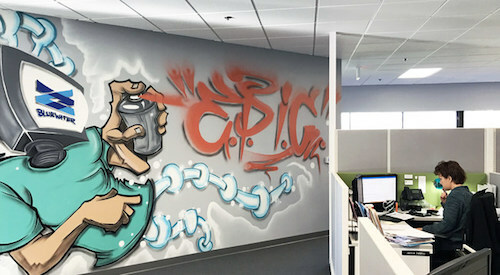 Detroit artist Antonio “Shades” Agee was commissioned to create interpretive graffiti to represent Bluewater’s personality and commitment to incorporating creativity and technology. A ribbon-cutting ceremony for the Farmington Hills facility is scheduled for Jan. 26 at 1 p.m. In addition to Southfield and Farmington Hills, the company has offices in downtown Detroit, Grand Rapids, Mesick (south of Traverse City), and Fishers, IN. For more information, contact hello@bluewatertech.com.